I am leaving home for a short business trip later today. My husband will be home alone, so yesterday I made two kinds of basic Korean soup for him to eat while I am gone. You guessed it. He does not cook. Thankfully, he does the dishes and keeps the kitchen organized since I am not really good at it. The first soup I made was a soybean sprout soup (kongnamul guk,콩나물국). 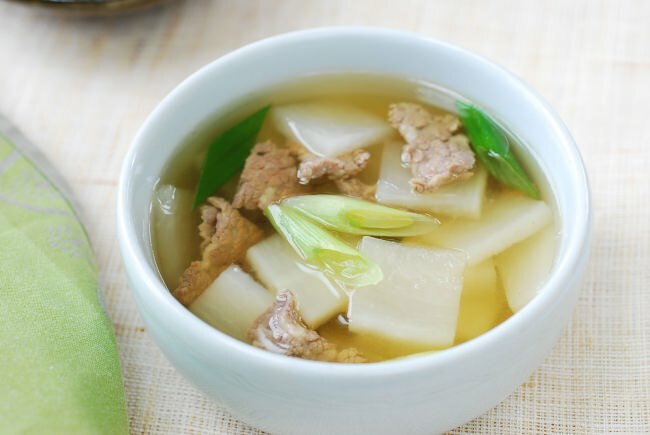 The other one is this radish soup (mu guk or muguk, 무국) made with a beef broth. Korean radish, mu (무), tastes best during late fall and winter. They are juicy and slightly sweet. Buy one that is firm and heavy. I used a quick method that’s common in Korean cooking to make a beef soup base. 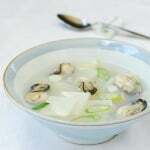 See another method in my tteokguk (떡국) recipe. 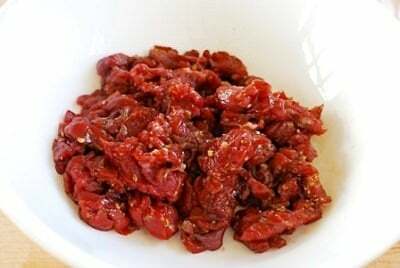 The thinly sliced beef is seasoned with Korean soup soy sauce and sautéed before being boiled in water. 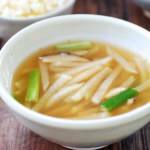 The result is a broth with deep flavors that deliciously complements the white radish. 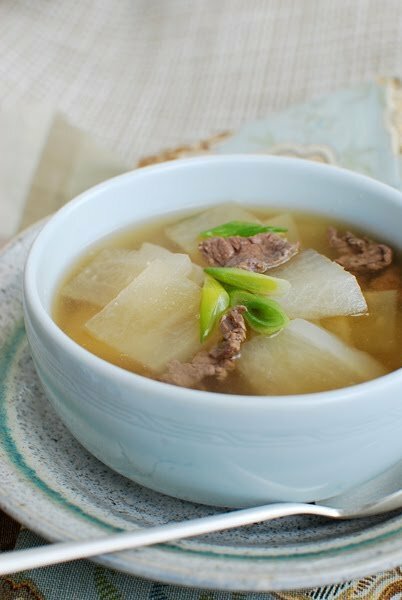 a Korean soup made with a flavorful beef broth and white radish! Cut the beef into thin bite size pieces (1 to 1 1/2 inch). 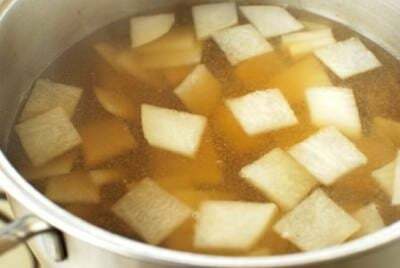 Marinate with 1 tablespoon of soup soy sauce, 1 teaspoon of garlic, a pinch of pepper, and 1 teaspoon of sesame oil. Set aside. 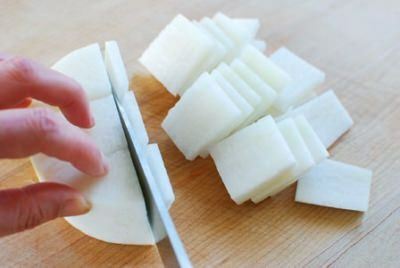 Cut the radish into bite size pieces (1 to 1 1/2-inch square, about 1/4-inch thick). Cut the scallions into 1 to 1-1/2-inch pieces. 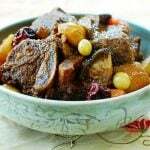 In a medium pot, sauté the beef until all the pieces turn brown. Pour in 8 cups of water and bring it to a boil. Skim off the foam. Reduce the heat to medium high and continue to boil, covered, for 10 minutes. Add the radish pieces and boil, covered, until the radish turns translucent and soft, 10 to 15 minutes. Stir in the remaining teaspoon of the garlic, scallions, and the remaining tablespoon of the soup soy sauce. The soup should not look too dark. Taste for salt and pepper. Boil for an additional 5 minutes. Do not substitute with regular soy sauce. It will be too sweet and dark. 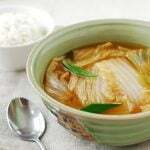 A better substitute is fish sauce, which is sometimes used in Korean soups. Oh, I’m so glad I picked up a bottle of 국간장 on my big trip to K-town yesterday–this looks like a great recipe to try! Thanks for posting, and have a good trip! Your husband is very luck! 🙂 I love mu guk! I will need to look for Korean soup soy sauce when I go to the Korean market next time. My husband loves soup based with beef broth but I am usually very lazy and use canned beef broth. I’m sure he would appreciate this soup made with beef broth from scratch. Your husband is so lucky to have such a wonderful and kind wife. 🙂 I am guilty of leaving my husband to fend for himself if I am not home for dinner and there are no leftovers! I <3 Moo Guk but those large Korean radishes are hard to find where I live. 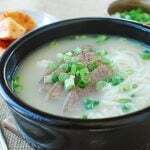 I love Korean beef soups and can eat them daily if given the opportunity. I didn’t know that there is a product such as Korean soup soy sauce? That ingredient would change my life (ha,ha). I hope I can find it at my local Asian grocer. I will be off to track one down today. Have a safe trip. Erica – Your Korean is very impressive! Hope you make the soup. Gukganjang makes a big difference. Judy – I don’t do that all the time. Sometimes he’s on his own. Then he makes ramen,instant that is, which is about only thing he makes. Tammy – Try with potatoes. My mother used to make gogi guk with potatoes and tofu. She would also put in dangmyeon (starch noodles) at the end. It was delicious, and I make this version once in a while too. Thanks for stopping by. Susan – Korean soup soy sauce does make a huge difference in Korean soup. It’s not expensive and you only need a little bit at a time. So it will last forever if you buy a bottle. Thanks for visiting. Korean radish is a variety of daikon radish (aka white radish). 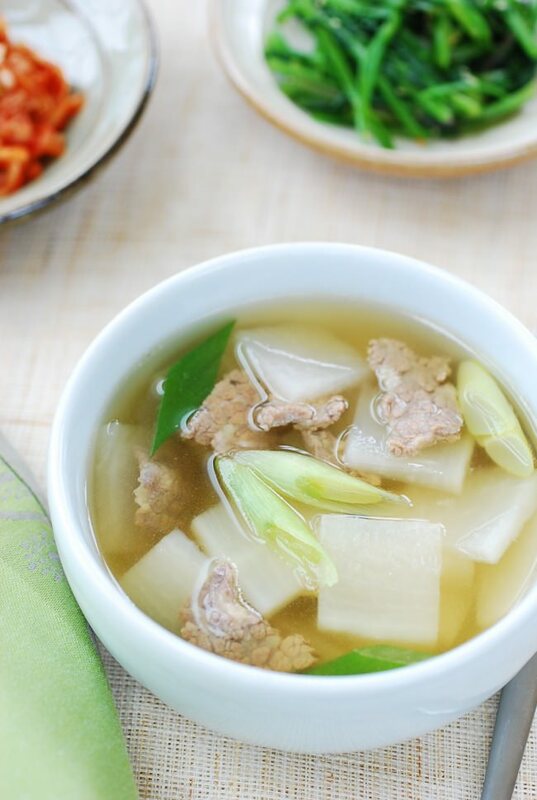 You can use any daikon radish for this soup. This kind of radish you used is different from daikon or is the same thing? Hi, I had a great excuse to make mu guk today because it has been raining like crazy in Los Angeles! Perfect soup for such a cold and wet day….mine probably doesn’t look as pretty as yours but if you have a chance you can look at the photo I posted on my Facebook page! It was delicious. Looks great! I am sure it was delicious and comforting. Yours definitely looks pretty too. Good job! Can anyone help me? I bought a Korean radish to make Kimchi but didn’t have the time that week. Now it is still sitting there… How long is it good for if I’m making this yummy soup? It still feels firm. Stella – I am not sure how long it’s been there, but it might be still okay to use. Radishes store well in the fridge. You can cut it up and see if the flesh is still juicy and firm. Hope this helps. Thanks for stopping by. There’s a reason why I have you as one of my top bookmarks. From the photography to the easy to read and understand recipes, you’ve single-handedly inspired me to get in the kitchen and cook! I live in Miami, where there are practically no Korean restaurants, and because of this blog, I’ve recently started to recreate my favorite Korean food at home. My mom and halmoni (who live far away) are proud– I’ve been emailing and calling them with all my cooking updates. Looks like my transition to being an ajjuma is almost complete! Alice – That is so sweet! I am totally flattered and appreciate your kind words. 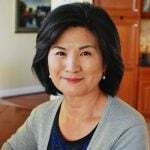 It’s very rewarding to hear from my readers that they cook Korean food at home using my recipes. I know I am very happy to hear from my kids about their Korean cooking, so I understand how your mom and grandma feel about yours. Keep up the good work! I’m so tempted to try this soup because it looks really good! How is Korean radish different from regular daikon? Fern – Korean radish is a variety of daikon radish (aka white radish) and smaller and bulkier. It has a little different flavor and texture too. Korean radish, I think, is crunchier and juicier. You can use any daikon radish for this soup. it came out just like my aunt’s soup. Thank you so much for posting this recipe. This will come in handy this winter. It is so delicious!!!! Thank you so much for this recipe. My family loves it! I made this dish for my wife the other day. I am a German living in Michigan now, but I spent six months in Seoul in 2000/2001 and since have been very fond of Korean cuisine. My wife (an Alaskan) was initially skeptical (a radish soup?? ), but I remembered it fondly from my time in Seoul. It tasted amazing! Thank you so much for that recipe, and I am looking forward to trying many, many more! You made my day!! Oliver – Thank you so much for trying out my recipe. I’m very happy to hear it turned out well for you. Hope your wife will fall in love with Korean food, and you guys can enjoy more and more together. Cheers! Your blog is great. So far I’ve made the moo guk and the sun du bu and thought they were both very delicious and authentic. Your directions are very easy to follow. Thank you! I have two questions about this recipe, if you don’t mind. The beef came out kind of tough for me. Is there a way to make it more tender? Just simmer it longer? Also, I think you need to peel the radish, yes? Again, thank you! Hi Sue – I’m glad to hear they turned out delicious. 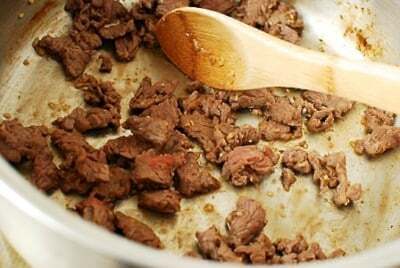 Cut beef thinner and simmer longer. Also, if you desire, you can use tenderer meat like rib eye or sirloin. No, you don’t need to peel radish as long as it’s clean. Hope this helps. Thank you for using my recipes. Cheers! Thank you for all the beautiful and informative posts! I can’t wait to try these recipes. 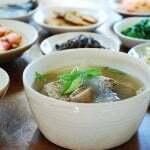 I am hoping you can help me to understand better how to serve soup and stew at a typical Korean dinner. I am going to be hosting some Korean friends for dinner to celebrate Dongji in a couple of weeks. I plan to keep it simple as I am just starting out with Korean cooking and don’t have the skills yet. Just rice, soup (maybe Kongnamul guk or Mu guk), some sides (banchan) and maybe a stew. Your blog will be a real asset for me and I’m very glad I found you! I have read several articles that seem to say each person receives an individual serving of rice and soup, and the other dishes are placed in the center to be shared. Would you be so kind as to review the logistics of serving a stew. How is it presented on the table? How is it actually dished up? It doesn’t appear that the individual place settings are set with an empty bowl, so I don’t really understand what to serve the stew into. I know these may seem like dumb questions, but I have been searching to figure it out with no luck so far. 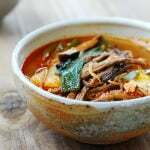 I would love to serve one of your delicious stews such as gochujang jjigae, but struggling to know exactly what to do with it once I have made it. Thank you again. Hi Charles – You’re right. In the case of soup, each person receives an individual serving along with a bowl of rice. The other dishes are served in the middle to be shared. We Koreans consider stews to be communal dishes, so usually a pot of stew is placed in the middle and shared. But, in more formal settings or when you have guests, it can be served individually like soup, or an empty bowl is provided for each person to take their portion. In your case, you are thinking of having both soup and stew, so each person would have two individually served bowls. That’s quite okay. I wouldn’t worry too much about these logistics. I’m sure your guests will enjoy the food regardless. Hope this helps. but let me know if you have any other questions. Cheers! Thank you so much for the recipe!!! Your website really makes making Korean food easier for someone like me who is missing the domestic gene…I made this twice already and even my husband enjoyed it 🙂 FYI I’m a horrible cook so for him to actually say that it was good is BIG 😀 I’m so happy I found your website!!! Aww I’m so happy to hear that. And glad to be helpful. Keep on cooking! You’ll get better at it each time. Thanks for coming by! Happy cooking! my mom made this the other day but she used fish sauce in it instead soy sauce is it the same dish or is it something else just similar. she wont write any of her recipe down for me so I’m not sure if its the same thing? It’s sounds like the same soup. Some people use fish sauce to season soups. Just matter of preference. I made this soup for my mother-in-law, she loves it. The soup was really light and being elderly, she said having the soup and rice was enough for a quick dinner. Thank you for sharing this recipe with us. Aww that’s so nice to hear! Thanks for letting me know. Thanks so much for all your wonderful recipes. This soup is the one I make the most–so simple but delicious and healthy! My mother says I’m a better cook than she is–all thanks to you! My other favorites include mandu and the jjukkimi gui–spicy–grilled baby octopus–all perfectly seasoned. Thanks again for sharing all of your well-written and authentic recipes. Great recipe and easy to follow, Loved the fast broth tip! My pleasure! Hope you find many more recipes you enjoy. Hello thank you for sharing. Can i substitute pork instead of beef?? Sure! I make some soup with pork. It’s delicious. My boyfriend was craving this soup but I was a little hesitant to make it because it has so few ingredients. Needless to say, I gave it shot and it was PERFECT! The broth is SO flavourful, you don’t need more veggies. The raddish is also very tender and has a great texture. I paired it with Dubu Jorim and Japchae, which all went well together. The savory quality of the soup balanced the intense spiciness of the Dubu. I used all the recipes from your website. You are a great cook and can translate ingredients and instructions well for English readers :). Thanks Hyosun for a fantastic site! 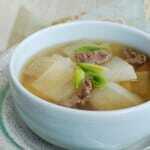 Like this sharing soegogi muguk menu for good, but I just used beef to corn beef and added some cayyean with mushroom. Because my family and friends like spicy food. Hello! I had a question. What happens if the soup looks too dark? Do you add more water? Thanks! Not unless if it’s too salty. It may be too dark if you used regular soy sauce, not soup soy sauce. Also, some soup soy sauce brands are dark. It’s not salty but you still want to make it lighter, you can add more water to dilute and add salt to season. Hope this helps! I’ve been making this soup for about a month straight as easy Sunday meal prep for lunches at least for the first half of the week. It is absolutely wonderful, savory and healthy. Nice! I love to make soups on weekends and enjoy for a few week days as well. And this soup is one of my favorites! Thank you so much for using my recipe and for the feedback! Cheers! I love that this recipe uses very little meat, comes out clean and full of umami flavor. I’ve tried different versions from different sites and hands down this is the BEST one. Though a humble dish, there’s a detail or two in this recipe that makes it perfect. This is a great soup for breakfast if you’re a traditional breakfast hater like myself. Egg, rice and radish soup. Yummm! All can be made ahead of time.